AC line powered applications which are not referenced to ground can present a voltage potential difference to a debugger, emulator or programmer referenced to earth ground or PC return through the USB connector interface of a PC. This can cause damage to both systems. to the tool or the target system as the full AC mains voltage will be applied. This condition can be hazardous to the operator in the form of an electric shock. Therefore, take adequate precautions to avoid this situation. In these instances, the development tool must be isolated. Carefully consider the ground system and signal return connections before connecting the tool to the target. 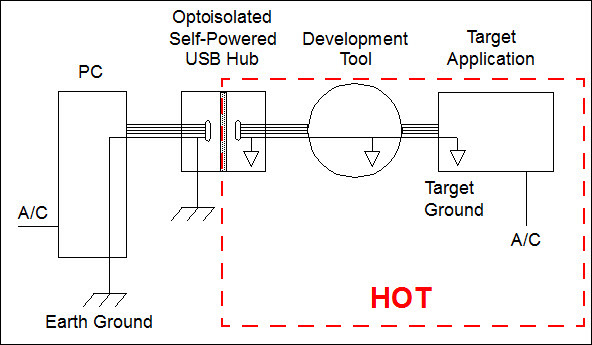 For hot or floating applications, a USB self-powered isolated hub should be used between the PC and the tool to provide isolation from the PC through the USB cable (see Figure). High/Low-Speed 4-port USB HUB, Model UISOHUB 4, B&B Electronics Mfg. Co. High-Speed, 7-port USB HUB, Model HUB7i, SEALEVEL Systems, Inc.
Keterex Inc., Single USB port, Model P/N KXUSB-150. IFTOOLS Gbr, Single USB port, Model ISOUSB-HVC. an electric shock. Therefore, take adequate precautions to avoid this situation.